Mike Thurmeier and Galen T. Chu’s Ice Age: Collision Course is the fifth entry in the Ice Age series and this time, the herd are tasked with saving all life on Earth. Yes, you read that correctly. This series has gotten so tired and bloated that it has got to this point. How could such a thing be possible you ask? Well, the answer is long, complicated and unnecessary. In short, that pesky Saber-Toothed Squirrel Scrat stumbles across a crashed alien spaceship and causes an asteroid to head right for Earth after he bumbles around the solar system. Buck (Simon Pegg) uncovers some stone tablets that clue him in on how to stop it and enlists the herd on a merry quest to save life as they know it. While that’s happening, the Mammoths Manny (Ray Romano) and Ellie (Queen Latifah) are having trouble accepting that their daughter Peaches (Keke Palmer) is growing up and wants to go out on her own with her husband to be, Julian (Adam Devine). A better film would have used this as the focus as this was the strongest material going on here. The idea of parents sitting on the sidelines as their children grow up to the point that they are ready to practice being self sufficient is a great idea, especially for an animated film with a young audience in mind. It’s something that could resonate with both children and parents but it gets buried under everything else that’s going on. The whole experience is so plodding and unfocused that it’s nearly impossible to become invested in anything that’s going on. 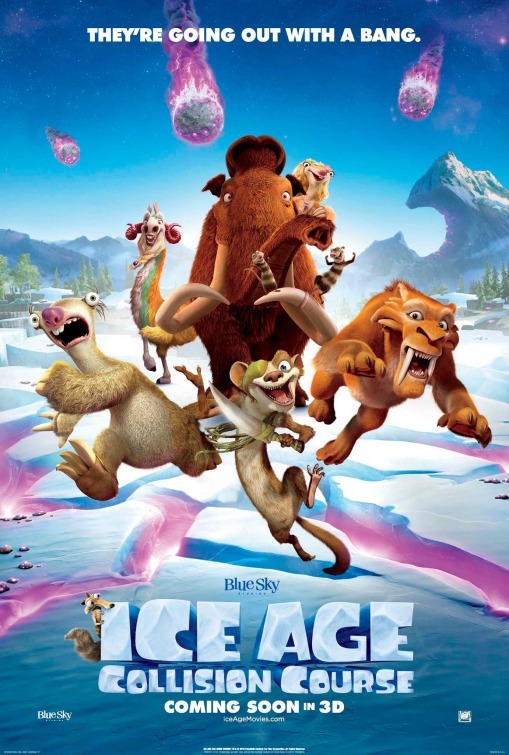 The first Ice Age was a fun film with really good characters but this entry definitely shows that the well of ideas has completely dried up. Outside of Manny and Ellie most of the characters have nothing of note to do. Saber-Toothed Tigers Diego (Denis Leary) and Shira (Jennifer Lopez) seem to have discussions about having children of their own but it’s brought up twice and doesn’t really go anywhere. Sid the Sloth (John Leguizamo) is still looking for a mate and fumbles around while being clumsy as well as idiotic so nothing has changed for this character. A group of Dino-Birds lead by Gavin (Nick Offerman) are what passes for villains in this film. Offerman’s vocal performance is completely on point but the characters are completely pointless. The giant asteroid threatening to wipe out all life on Earth was enough of a threat without having these characters slowing the pace of the film down. I’m being very hard on this film but I imagine that young children will love it. There are a lot of slapstick gags where people get hit in the face by things for example as well as pop culture references that went over my head but are probably intended for a younger audience. There are some attempts to connect with the adults but they are less than frequent and really didn’t work for me. Ultimately this is a franchise that should be allowed to go extinct while it still has some dignity left. A pointless sequel to a series that was once a lot of fun. The story is overly complicated and boring with characterisation that fails to impress as well. Lot of the humour will appeal to the very young but there’s nothing here that hasn’t been done better elsewhere. The best thing for this franchise is to be left in the past where it belongs.